Privacy – Why I care! TL;DR: someone went through emails I thought were private collected the email addresses and sold them to linkedin who offered me these addresses as possible contacts I should Invite. Several of these people have passed away, I feel violated. I think everyone should care about online privacy and so do others like the EFF. Which is why they collect #privacystorys on twitter. Online privacy has mattered to me for a long time not only since watching Citizen Four or Democracy or reading Little Brother. I started thinking that privacy must be important when bringing PGP outside the US was considered “munitions export without a license” in the early 90s . And every time someone wanted to forbid encryption after that. Just this week I wrote an article on how to improve online privacy. Oh the irony. We all have secrets, we just don’t always realize what they are. And in this age of technology all of these secrets are constantly in danger of getting into the wrong hands. This started out as an email to a concerned friend, so it may not be complete or a bit unfocused. Please discuss, I welcome your thoughts and input on this. A note to start. Privacy and security intersect so much on the internet that it is quite hard to see if a problem is more one or more the other. With the current state of things the biggest threat to the average user does not come from the state but rather from big corporations analyzing our data 1. The second biggest threat is not for our privacy but security … being hacked is much more likely to hurt us in some way than the [insert your favorite spook agency here]. So in my opinion one cannot ignore one or the other. They go hand in hand. Another good starter is to read the Cory Doctorow book Little Brother and its sequel. He explains quite a few concepts much better than I ever could. Never follow advice blindly – even this! Don’t put all your eggs in one basket is a good strategy. It may seem tempting to use one service to rule them all … but don’t, just like you shouldn’t use the same password everywhere, diversification helps to protect you. (2) how could I know they would call it Prism? (3) the piece does not have a happy ending! Really 2013! It would be even more fitting if I’d named the character Julian or Edward. But I can’t encrypt my email if you don’t have a key, too. So please get one! Als selbstverantwortlicher Androidentwickler braucht man schon auch das ein oder andere Testgeraet. Somit habe ich diese Woche ein Galaxy Tab 10.1 erstanden. Nicht in Deutschland natuerlich. Aber in England darf es ja noch verkauft werden. Fuer ca. 550€ ihr wollt es ja eh wissen. Der Preis fuer so ein Geraet ist happig. Erst recht noch wenn man es mit umts haben wollte. Ich habe mich mit WiFi begnuegt. Wofuer ich das brauche? In erster Linie zum entwickeln. Es ist zwar ein nettes Spielzeug aber zwischen Desktop Computer, Laptop(s), Kindle und Smartphone bin ich eigentlich versorgt. Fuer immer dabei ist ein10″ Tablet leider ein wenig zu gross oder meine Handtasche zu klein. Ich werde sehen wie es sich im naechsten Urlaub als Laptop Ersatz schlaegt. Allen Nicht-Entwicklern wuerde ich raten noch 1-2 Generationen abzuwarten. Die Hardware ist zwar schon sehr cool, aber noch sehr teuer. Es kommt ja noch das Usb Kit dazu fuer 50 € damit ich die Kamera ueberhaupt anschliessen kann und eine Schutzhuelle fuer ebensoviel. Vor allem duerften ja die meisten bereits mit diversen anderen mobilen Devices versorgt sein und wirklich brauchen tun wir die Dinger nicht. Cool sind sie trotzdem. Alle Tippfehler sind Schuld vom Onscreen Keyboard! Somehow I manage not to write here very often. This time I have a good reason or so. I’ve been spending my time over at my new blog: work reloaded. The app is not completely finished. I expect to finish a beta towards the end of the month. My backlog still has a couple of Prio A and B items I just cannot publish without. Still you can see I’ve come a bit further than “Hello World” by now. playing games: Civilization V (rocks!!!) and Plants vs Zombies (can’t stop!). Ich habe mich endlich in die reihen der smartphone besitzer eingereiht und werde ab sofort kluge beiträge von meinen neuen spielzeug aus scheiben. Wir haben es, dank der netten Einladung aus Mülheim, auch in diesem Jahr wieder zur SPIEL nach Essen geschafft und haben den Samstag und Sonntag dazu genutzt uns viele coole Spiele anzusehen und eine ganze Reihe davon auszuprobieren. Gekauft haben wir allerdings nur ein einziges Spiel. 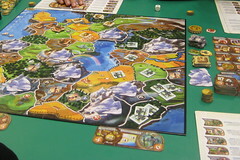 Auf Flickr habe ich ein paar Photos von der SPIEL 2010 hochgeladen mit den Spielen, die wir gespielt haben und jeweils einer kurzen Bewertung. The install is fresh and there is still a Windows installation on the hard drive, but – as you can read on my WoW blog – I am back to using Linux at home. I needed a re-install of Windows and ended up downloading Ubuntu. I had been putting off installing Windows forever – once I decided to give Linux gaming a chance it took me one day to motivate myself and it paid off: installing Ubuntu has become trivial. I was very impressed with the ease of everything. Gone are the days of cryptic installers where you have to be an expert for hardware and software specifics to get a nice system running. The most impressive is that booting the Live CD (aka USB drive in my case) is quick and easy and then you just have to click the “Install” button and while you watch the Installer do it’s thing you can surf the web. I had assumed the browser was only for show but when I started it and entered the guild’s forum url … I started laughing, because it isn’t for show. I have already solved several of the remaining “problems” I had with my gaming keyboard and the games. Fun – windows-less – times ahead! Amazon is too fast. The game was ordered and only hours later we found out that it is one of the games that infects your computer with the malware that is SecuROM. By that time it was already sent out and we could not cancel the order anymore. On Amazon.de and Amazon.com the game is getting tons of 1-star reviews because of this. As I write the number of negative reviews nears the 2k mark on Amazon.com. While I think that the negative reviews are much better than not buying a game, I am not willing to have a DRM-Rootkit on my computer. Thanks no. I’ve always been a paying customer for all you DRM industries out there. This game I am returning. It wouldn’t be so bad if it was just some DRM but SecuROM is really just too much. I was once of the opinion that drama was typical of my social adventuring in World of Warcraft guilds. Well don’t feed the trolls they say. But WoW is only a game and as such expendable. It is not so with some other things.